1) This article was presented at the 8th FIG Regional Conference, 26-29 November 2012 in Montevideo Uruguay. The authors argue that conventional land registration systems often do not produce the desired results in uncertain land tenure situations such as peri-urban areas in developing world cities, post-conflict situations, land restitution cases and aboriginal lands. They introduce a methodology “The Talking Titler” system. The methodology was conceived in South Africa, and has recently been tested in Canada and Nigeria. Key words: land tenure information systems, evolutionary design and development, wicked problems, uncertain land tenure situations. Conventional land registration systems often do not produce the desired results in uncertain land tenure situations such as peri-urban areas in developing world cities, post-conflict situations, land restitution cases and aboriginal lands. The Talking Titler system is a software design and development methodology where flexibility in creating relationships between people and between people and their interests in land has been the primary design feature. It uses a range of structured, unstructured and semi-structured data types as evidence such as videos, photographs, documents, maps, digital graphics and sound recordings. It is most suited as a tool for prototyping and for evolutionary land tenure information system design and implementation. In its current form it is also a good training and information design support tool, and it can be used as a local level land records system. The methodology was originally conceived in urban informal settlement upgrade projects and land reform and land restitution projects in South Africa in the 1990’s. In recent years, the concepts have been tested through interviews with aboriginal peoples groups in Canada and field trials in Nigeria. This paper provides an overview of the conceptual design of the system, how the design was formulated, testing of the system, and current development. The current version uses a conventional relational database design. The research team has experimented with evolutionary database development using extensible markup language (XML) databases and self adapting software to reduce the human input into system changes. A current project is examining how to evolve the database using social network analysis. We present an evolutionary design approach and overview some of the software design and testing procedures in developing a flexible, evolving, land tenure information data model in wicked land tenure problem situations (Barry and Fourie 2002a). We then describe an initial attempt at developing a self-adaptive land tenure information system based on XML data structures and the eXist database as a way to reduce some of the problems associated with evolutionary design approaches. The design priority is promoting equity and fairness at the local level, incorporating the claims of vulnerable groups in what are often highly complex, rapidly changing, local political situations. A record of personal relationships and how these change as a situation changes may contribute to these ideals. The focus is on land tenure management in uncertain situations and times of major change. It draws on field work in informal settlement upgrades, peri-urban customary tenure regimes, post-conflict situations, and land regularisation as part of programmes to mend dysfunctional land administration systems, and land reform and land restitution cases (Barry et al 2002, Barry 2009c). We have also examined the feasibility of the approach in using recordings of oral history and oral tradition in aboriginal land claims (Barry and Khan 2005). Flexible database structures are likely to form a significant area of interest in land administration systems. Over the past decade, there has been much interest in standardized data models for land records, such as the Land Administration Domain Model (LADM), which is an ISO standard (ISO/FDIS 19152, Lemmen et al 2011). However, in contrast to bureaucratic situational cultures that characterise many land administration institutions, uncertain tenure situations are unlikely to be well served by a standard model, or top down design approach, as user needs are often difficult to define. If justice and fairness at the local level are driving principles in a land administration programme, which we submit should take priority over grand economic development plans, we should be careful not to inadvertently extinguish the interests of vulnerable groups. We argue that land record systems in uncertain situations should be sufficiently flexible to handle frequent change in system requirements, unconventional data forms and structures, and unforeseen user requirements. From a design philosophy perspective, we should be mindful to allow for a situation where an information system design that is radically different to anything that has been used before may be required to address a particular situation (Barry et al 2013). In essence, we are arguing for design in wicked problem situations. In designing for wicked problems the problem is not easily defined and stakeholders seldom agree on the exact problem to be “solved”. In short, wicked problems require complex judgements about the level of abstraction at which to define the problem (e.g. substantive or micro level versus grand or macro level). They lack clear rules as to when a project should end, the development process is heuristic as there are no better or worse solutions, and there are no objective measures of success. Information system development requires iteration, as there are no given alternative solutions; these must be discovered through trial and error. Importantly, wicked problem scenarios often have strong moral, political and professional dimensions (Rittel and Webber 1973, 1984, Buckingham Shum 1997, Barry and Fourie 2002a, Patel 2009). In short, attempting to state the problem is a major problem in itself, and many situations in which tenure transformation takes place can be classified as wicked problems. Land registration is the conventional means of statutorily securing rights in land. In terms of the theory that land titles are a primary driver of economic development, recently popularised by de Soto (2000), but postulated by a number of others dating back to the mid 1800’s, land titles provide tenure security, which in turn allows property owners to secure loans using their land as collateral, which in turn stimulates economic activity and thus alleviates poverty (Shipton 2009). Advocated as an economic development and poverty alleviation strategy, in practice this theory can be shown to work for the affluent, the middle class and some of the less affluent sectors of society. Although it has been presented as a grand theory for economic upliftment and poverty alleviation, empirical evidence suggests the land title theory is not valid in many situations. A number of observers are strongly critical of it, as practical titling projects have been implemented based on this theory without due regard for the conditions that have to be in place for it to hold. Instead of promoting tenure security, the risks of applying the titling theory uncritically include (1) it may be contrary to complex, changing, continually contested, land tenure practices on the ground, and instead of supporting a stable, secure tenure environment, titling may foment conflict, (2) it can disempower certain sectors of a community and extinguish existing land interests, and facilitate land grabbing, and (3) secondary market transactions may not be registered which in turn means it fails as a prescription for economic activity and the formal land market is frozen as few formal financial institutions will accept cloudy titles as collateral (e.g. Payne 2002, 2008, Payne et al 2009, Gilbert 2002, Deininger 2003, Deininger and Feder 2009, Augustinus and Deininger 2005, Shipton 2009, Roux and Barry 2011, Cousins et al 2005, Sjaastad and Cousins 2008, Platteau 1996). The question then is if land registration is ill suited to certain situations, what are the strategic alternatives that should improve tenure security justly and fairly? One part of a strategy, we submit, may be a land tenure information system that incorporates far more relationships and more complexity than a typical registration system handles. The paper proceeds as follows. In the following order, we briefly examine different initiatives to develop land tenure information systems (LTIS) that serve as alternatives to registered titles, information system design strategies, aspects of evolutionary information system design, why this is necessary, and some design aspects of the Talking Titler software. We then move on to methods of creating land records in uncertain situations, and how these records may evolve as a situation changes. Following this, we overview a part of our work on schema evolution and self adapting software, as a way of addressing the evolutionary system design concept. Finally, we overview a prototype design and testing of schema evolution and self adapting software methods in land tenure information systems using the eXist-db open source XML database. There are a number of recent initiatives to develop information systems that will cater for situations where titling is inappropriate or unaffordable. These include the UN-Habitat supported Social Tenure Domain Model (STDM) (Lemmen et al. 2007) and a commercial package, Open Titler, which is based on the STDM design (Edmead 2010). In addition, UN-FAO is developing the Solutions for Open Source Software (SOLA) system that uses the Land Administration Domain Model (LADM) as a point of departure. It aims to make land registration and a computerised cadastre affordable for developing countries (Pullar 2012). The UN-FAO SOLA system initiative, however, does not appear to be targeted at situations where registration is unlikely to suit the particular circumstances at a given time. The mission is to make registration more accessible (Pullar 2012). The Talking Titler system is a design methodology, which the authors are working on, which aims at addressing wicked problem situations where titling is inappropriate at a given time. The methodology is based on field work and design work in South Africa dating back to the 1990’s (Barry 1995, Mason et al 1998, Barodien and Barry 2004, Barry et al 2002, Roux and Barry 2001, Barry et al 2009), Somaliland (Barry 2009a), Nigeria (Barry 2009c), Ghana (Danso and Barry 2012), and an exploratory investigation with First Nations communities in Canada (Barry and Khan 2005, Barry 2009b). We first analyse the STDM, and compare it with the Talking Titler design. We do not review the SOLA initiative as, apparently, it is not targeted at wicked problem situations (Pullar 2012). 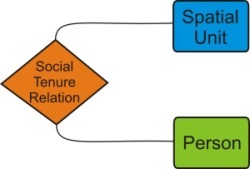 Figure 1 Social Tenure Domain Model (STDM). STDM is an adaptation of the Land Administration Domain Model (LADM). The LADM is an ISO standard, linked to initiatives by the Open GIS Consortium (OGC) and Infrastructure for Spatial Information in the European Community (INSPIRE). The LADM core is based on two core classes Person and RegisterObject (e.g. a title or deed), which are related through a third class RRR (Rights, Restrictions, and Responsibilities), which can be expanded into a number of specialised sub-classes (Hespanha et al 2008, Lemmen and van Oosterom 2006). The STDM is proposed as a specialisation of the LADM as an ISO standard (Lemmen 2010). As per figure 1, the STDM has recast the Rights, Restrictions and Responsibilities relationship as Social Tenure. The RegisterObject class has been renamed SpatialUnit, and the Person class is unchanged. Lemmen et al (2007) argue that it is possible to merge formal and informal tenure systems in STDM. This is achieved by introducing lookup tables and keywords to represent different kinds of SocialTenureRelations (formal and customary relations, instead of rights, restrictions and responsibilities) such as ownership, apartment rights, possessory rights, Waqf (Islamic law), occupation interest, and other similar rights and interests. The simple form of the STDM design is a major strongpoint, as simplicity should lead to a system that is easy to use. The three primary classes in figure 1 are likely to prove to be suited to many situations. However, as noted above, simple form may not capture the complexity of a number of situations, especially if these are wicked problem scenarios. The STDM is an adaptation of the LADM core, which was developed for a very different set of circumstances (i.e. the European Union) and grounded in a top down rather than systemic way of thinking about problem situations. Our main criticism is that setting the STDM as an ISO standard is premature. It is a prescription yet to be supported by compelling evidence derived from long and sustained usage. An international standard should be based on empirical support in a number of different types of situations over long periods of time. As the discussion above indicates, there is empirical evidence to show when titling is appropriate in a given situation and when not. In contrast, we have yet to acquire sufficient, appropriate, long-standing and diverse empirical evidence for any alternative LTIS to be promoted as an international standard. The risk of setting it as an ISO standard may result in it being specified in project documents without the critical scrutiny to check if it suits the local circumstances. Suitability to circumstances is nothing new as a critical success factor (CSF) in land tenure information systems; it was listed as a CSF for a registration system by Fortescue-Brickdale (1913) one hundred years ago. Figure 2 portrays different future states for an evolving LTIS. Scenarios A, B and C represent some form of system with which designers are familiar, such as an existing registration system, an occupation permit system, taxation information system or combination of these systems. The fourth one represents the very different system alluded to above. To address these different scenarios, there are two approaches to system design. The first approach addresses the completely new scenario, and has parallels with grounded theory research methodology in the social sciences. The design should be grounded in the data, and in an uncertain situation the design should emerge from the data rather than a top-down prescription. The initial design focus should on the data alone (Media class in figure 4). The second approach addresses scenarios A, B and C and it allows a LTIS to evolve based on four core classes, Media, Person, Land Object and Reference Item (see figure 5). (The Person and Land Object classes have equivalents in the STDM and LADM). Evolution tends to occur based on one or more of the Person, Land Object and Reference Instrument classes. The Reference Item class reflects what happens in practice most of the time. In our studies, local record systems tend to be based on some form of reference document or documents, such as a title, a file number, a rent card or occupation permit and some form of map with unique identifiers to model land parcels, linear and point features and 3-d objects (e.g. building or shack numbers). Media may comprise unstructured data items, such as video clips, photographs, sound recordings, written notes and reports, and formal or iconic data items such as title deeds, contracts, permits, wills, marriage contracts and cadastral survey plans. Our limited experience at the local level indicates that several system starts ups and failures may occur in uncertain situations. Thus a design may revert back to the starting point, i.e. the data in the Media class, if the first design does not work. Experience has shown that in certain situations, a “well designed” GIS may be ignored by people on the ground, even if they participate in its development. Instead, completely unstructured data, such as the noting of events and relationships in a notebook (or sound recordings or a video) may be appropriate at a particular time (Barry and Fourie 2002a). We can consider two forms of information system design and development, top down and evolutionary. A top down approach is ideal in stable situations where the problem contexts are simple and well understood, and it fits in well with the bureaucratic organisational culture typical of many land administration institutions. Top down, detailed design is especially appropriate in the design and implementation of information systems which support land registration. Land registration’s primary purpose is to provide procedural effect to real property law (Ziff 2006). It follows that there may be severe legal and social repercussions if an information system that supports legal procedure is ineffective, particularly if it does not deliver what the law prescribes. At the national or jurisdiction level, a host of other land administration functions draw on land registry data, hence the need for broad top-down inter-institutional LIS planning and design. In evolutionary design, the planning philosophy is not to plan; information systems evolve and a clear end goal is not known (Patel 2009, Miller 1985). It fits anarchic or democratic organisational cultures, where creative thinking, risk taking and innovation are encouraged. Innovative solutions may arise from this method, but the risks are that incompatible systems and nodes of information systems power may emerge in different locations and institutions. Ideally, however, some form of coordination institution should oversee the process to avoid vastly different, incompatible designs emerging which cannot be integrated or at least harmonised with a jurisdiction based LTIS at a later stage. Thus standards such as the LADM serve as a useful reference point, even if the design emerges and evolves from the data. However, this is outside the scope of this article. We now move on to a discussion of the conceptual data model for evolutionary LTIS development based on the Talking Titler model. The evolutionary model involves continual prototyping and development. Prototypes can take on a number of forms. Of relevance are throwaway prototypes and evolutionary forms. The throwaway type is used to explore and experiment with certain parts of the final system design and it is then discarded. In the evolutionary form the software may evolve from an initial form featuring a number of core features which will be retained as it is gradually developed to a final form (Davis 1992, Budgen 2003). Both of these forms may be relevant to LTIS evolution. An evolutionary development approach starts with an initial operational system which gradually evolves over time. The initial operational system builds the core requirements that are well-understood, and it progresses as modifications to requirements are required and other requirements emerge. This approach works well when users are unsure about what they want initially (i.e. uncertain user needs), but they can formulate an idea about them when they see them implemented in a working system (Boehm 1988). In evolutionary development, the system changes on an on-going basis. Often there is no notion of a final product, but rather the notion of current state of the system (Patel 2009, Budgen 2003, Beynon-Davies et al 1999). 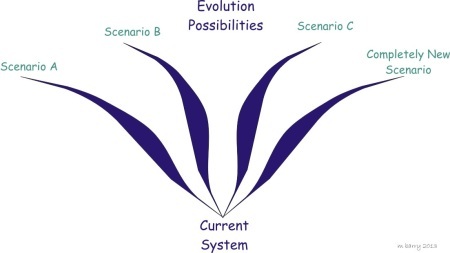 As per figure 3, the evolutionary process commences with a simple, flexible, initial system. The initial system is designed to address an immediate problem situation, such as the post-conflict rebuilding process following civil war, where the social and political environment is likely to be unstable, uncertain and rapidly changing (Augustinus and Barry 2006). The initial system implements basic requirements only, while allowing a great deal of flexibility in how this is achieved. The primary purpose is to collect data quickly, allowing different data types to be collected within a loose structure (Muhsen 2008). The more uncertainty in the situation the information system is meant to serve, the more flexible it should be. In our work to date, the initial system comprises two main components, an initial three class data model and the initial software prototype. The data model has three general abstract classes, namely Person, Land Object and Media as per figure 4. Each of these can be related to the other classes and to itself in many-to-many relationships. operator). Social structures and lineage groups are represented via recursive relationships (a relationship between a person and another person) which enable modelling parent–child relationships, inheritance, and other interpersonal relationships. The Land Object class may represent things such as parcels, volumes of space, dwellings, trees, hunters’ trap lines, religious artefacts, water bodies, mineral deposits, and/or any spatial object of economic or cultural value (Muhsen and Barry 2008). Recursive relationships on Land Objects allow situations within and between objects to be modelled. For example, a dwelling is located on a parcel and a tree may be located on the same parcel. Entitlement to the land may be held by one person, the dwelling by another and the tree by yet another person. The entitlements to use the dwelling and parts of the fruits of the tree may vest in a number of other persons, which in turn may stem from a number of personal relationships. The Media class contains a mix of records that might represent different items of evidence relating to the existence of persons or land objects and the relationships between them such as interests and obligations between people and between people and the land. The data may be structured, semi-structured and unstructured. Media items might include, for example, titles, deeds, and survey plans describing parcel lots, marriage certificates, and rent cards, and multi-media recordings of dances, stories, ceremonies, video recordings of customary rules relating to chieftaincy succession and land allocation rules, recordings of symbolic land transactions, meetings, dispute resolution proceedings, and personal testimonies. The recursive relationship relates a media item to another media item. For example, in a conventional cadastral survey records system when a new survey diagram supersedes a cancelled survey diagram, it is necessary to keep both media items in the system and relate them to retain the chain of title. If we fail to relate them, we may lose the chain, and possibly vital evidence in the event of a boundary conflict. Or, audio recordings may be used in conjunction with photographs (a slide show) to capture an event, and all of these media items should be related to one another or to the event. The system may evolve in a number of different ways, and we have experimented with schema evolution to manage this to address a set of known outcomes such as scenarios A, B and C in figure 2. Schema evolution in this experimental work implies adding more general classes to the three main classes in Figures 4 and 5, by decomposing the generalized classes into more specialized ones, and adding additional attributes to these classes (Molero et al 2010). Using the example of a post conflict situation, it may be necessary to change the schema in a vastly changing environment to address more specialised needs. For example, we may introduce a fourth general class, Reference Instrument as shown in figure 5. We may start off using a variety of reference instruments, such as certificate of occupation, taxation certificate, title deed and so forth, in this class and differentiate between them by identifier type. We might then choose to separate these into sub-classes of the reference instrument class at a later stage once we are reasonably certain that the design meets the situation’s requirements. As figure 6 shows, we could specialise classes in the reference class, such as a deed and a valuation record, and keep all other types of reference instruments in the parent reference class until we’re reasonably certain that we will keep them, whereupon we will separate them into specialised classes as the system evolves. Figure 6 Talking Titler Specializations of Reference Instrument Class. In an ideal design, we should be able to generalise the system to revert back to an earlier state. The system may evolve from System0 through several stages to say System7 (Figure 3). It may then be found to be completely unsuitable and we may have to start all over again at a new System0 (e.g. if there is a change in government which has a different approach to land management and administration) or revert back to an earlier system number. Ideally, we should be able to revert back to any particular evolutionary stage. We now describe the concept of self-adapting software using a XML database. Using a XML database has advantages in an evolutionary approach as in general a XML database is more flexible than a relational database. On top of this, it should be easier to extract data from the system at any stage and allow it to be used by a new, evolved, system or by other systems. Changes in a system can be frequent, unforeseen, and caused by a diversity of factors (Buckley et al. 2005). Continual prototyping and development associated with the evolutionary process implies repeated refactoring of the system, which requires skilled IT personnel and the associated costs. This places a question mark over the feasibility of an evolutionary model, given that budgets and IT skills capacity are often limited in uncertain land tenure situations (Barry and Fourie 2002b). In order to reduce the negative impacts of the evolutionary development approach, self-adaptive systems may alleviate some of these problems. A self-adaptive system is a system which has the capacity to modify itself at runtime in response to changes introduced by an internal decision making process or by external factors such as user input (Andersson et al. 2009, Salehie and Tahvildari 2009). Modelling Dimensions. This concerns the definition of models that represent: (1) objectives, (2) changes occurring at runtime, (3) how the system should react to those changes, and (4) dealing with the effects of changes. Requirements. This concerns the specification of: (1) what the system should do, (2) what adaptations are possible, (3) constraints on these adaptations, and (4) how to deal with the uncertainty of not knowing what future requirements could be. Engineering. This concerns the implementation and control of the feedback loop that underlies the dynamic behaviour of the system which enables internal decision making and self-adaptation. Assurances. This concerns the assessment, verification and validation of the changes taking place on the system at runtime. To improve feasibility prospects, a self-adaptive LTIS development approach should address these factors in a manner that the complexity and costs associated with self-adaption do not outweigh the benefits of flexibility. Special emphasis should be made on quality management as changes occur, especially data and relationship integrity, because LTIS are especially sensitive to users’ trust. Incorrect information in land tenure recording processes can have major social and legal consequences. Addressing the above challenge is not trivial and there is no general or simple methodology for developing a self-adaptive system. Ideally a self-adaptive system should be able to handle whole feedback loop iterations in an evolutionary cycle on its own (see Figure 2). However, to achieve the ideal where no human intervention is needed is perhaps utopian, but a self-adaptive approach may result in a significant reduction in human intervention. To date we have experimented with self-adaptation at the database level, which we describe in the next section. Other components that have to be adapted as a system evolves in the multi-tier software architecture used in our exploratory self-adapting system are the user interface and the middleware that handles the interaction between the interface and the database. XML (W3C 2008) is a widely used markup language and data format, especially for data exchange between applications even when these applications do not store data under the same structure. Among its benefits are flexibility and ease of use as users may specify their own data structure and extend the structure it to meet their specific needs (Harold and Means 2002). We developed and tested a self-adaptive design using the eXist-db open source XML database based on a case of an informal settlement upgrade where people were moved from shacks in an informal settlement to formal houses in a new development (Barry 2006). There are four phases or evolutionary steps in the experimental model. 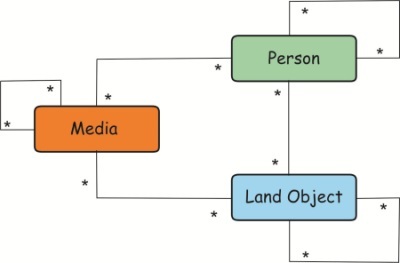 In Phase 1 social and demographic information is captured as multimedia and text documents (MEDIA class) and related to the people living in the informal settlement (PEOPLE class) and the shack that they occupy (LAND OBJECT class) (see figure 4). In Phase 2 the local authority decides to relocate the people in each shack to a formal house in a different location. This change is represented as a new relation between two land objects, the shack and the house (figure 4). In Phase 3, official recognition of rights over the new land is addressed by issuing an occupation permit to the families, introducing a new INSTRUMENT class and its relations to the existing classes (figure 5). In Phase 4, formalization of rights over the new land is completed by issuing a title; the title is linked to the household’s occupation permit in case of fraud or errors in the process. The people who were not allocated a house remain in the informal settlement and the occupation permit provides official recognition of an occupation entitlement. Drawing on Figure 6, the INSTRUMENT class is specialised into an OCCUPATION PERMIT class and a TITLE CLASS. Phases 2 to 4 impose changes to the database structure. The introduction of these changes is possible because of the database schema evolution process built into the database. The main objective is to allow for specialization of the land administration model over time. The database should be flexible enough to allow for database schema changes while preserving existing data and consistency. The initial land administration model should allow the changes in Phases 1 -4. Possible changes to the initial model include: adding new classes, adding new attributes to existing classes, defining relations between classes, modifying existing classes, and specializing classes through inheritance, among others. Changes in the initial model should be translated into database changes. Existing instances of the data should be updated if their structure has been changed. Automation of the adaptation process model change - database schema update -instances affected migration should be done with minimal intervention by the database administrator. The initial model is represented in UML, which it is then stored as XMI (XML Metadata Interchange; a XML for model representation and exchange). The initial model is translated into a XML Schema (W3C 2004). Data instances are stored following the current XML Schema. Changes in requirements are introduced in the form of changes in the UML model. The adaptation process is triggered by user input on the UML model. The series of changes provided are in turn converted into XML Schema changes. No XML instances updates are performed unless they are solicited by the user in which case the instances are transformed to conform to the new schema before the instances reach the user. The feedback loop is controlled in such a way that intervention from the database administrator is expected only if strictly necessary. All changes occurring at runtime are documented within the database for validation purposes. Validation of the schema evolution mechanisms taking place is currently performed verifying the correctness of the data instances after the adaptation occurs; i.e. old instances still exists, old instances meet the new database schema, old instances are still correct, and new instances are stored using the new database schema. We could not get the process to work entirely through all four phases as there were some types of changes that required an administrator’s intervention (Molero et al 2010). However, these can be addressed with further work. Notwithstanding, the design and testing indicates that the concept does hold promise and that forms of self-adaptive LTIS are feasible with further work. In conclusion, flexible and evolutionary LTIS systems are one strategic option where conventional land registration systems, with their rigid rules and procedures, are not suited to the local circumstances. We have described a conceptual approach to the evolutionary LTIS development problem and one area of design, development and testing that our research group has done in this area. These are concepts that may evolve into practical solutions in the future, but significantly more work needs to be done in this area. In the mean time, at the practical level, flexible evolutionary methods should be developed and applied in computer assisted applications on the ground that accommodate both analogue and digital data. In our observation, the reality is that many digital land information systems are designed and implemented using a project based approach, with little attention to the systems required for the system to be a going concern. Thus system planning should accommodate the scenario where a computerised system may collapse completely - for a variety of reasons (e.g. key staff members leave, computer hardware breaks down or is destroyed, failure of management to maintain administrative procedures). A XML based approach to data storage and sharing, along with well designed methods of storing data outside of the IT system but in parallel with it, e.g. using hard copy plans and documents to perform administration and filing systems that accommodate DVD’s and similar devices to store multimedia data, may mitigate some of these risks and facilitate the revival of the system. A problem is that flexible, evolutionary forms of LTIS tend to lack appeal to the user community. As outlined elsewhere (Barry 2009b), the simpler the LTIS, the more likely it will be easy to use and the more likely the system will actually be used. Conversely the simpler the system, the less likely it will provide an adequate model of complex tenure situations or address wicked problem situations. In a worst case scenario, a simplistic system may exacerbate an already troubled situation. The more flexible the system, the more relationships and the greater the level of complexity can be modelled, and the more likely it will be mirror the situation on the ground. But, the more flexible and complex the LTIS, the less likely it will be easy to use, and the less likely it will actually be used. It is a conundrum that has kept information system designers occupied for a long time, and it should keep LTIS designers and researchers similarly occupied. This study was supported by the John Holmlund Chair in Land Tenure and Cadastral Systems and the Canadian National Science and Engineering Research Council Talking Titler project. Andersson, J., de Lemos, R., Malek, S., and Weyns, D., 2009. Reflecting on self-adaptive software systems. In Software Engineering for Adaptive and Self-Managing Systems, 2009. SEAMS '09. ICSE Workshop on. Software Engineering for Adaptive and Self-Managing Systems, 2009. SEAMS '09. ICSE Workshop on. pp. 38-47. Augustinus and Deininger, 2005. Innovations in Land Tenure, Reform and Administration in Africa. Available at http://www.capri.cgiar.org/wp/..\pdf\brief_land-06.pdf. Augustinus, C., and Barry, M., 2006. Land Management Strategy Formulation in Post Conflict Societies. Survey Review, 38(302), 668-681. Barodien G and Barry M 2004. Palm Computers for Spatially Referenced Social Surveys in Upgrading Informal Settlements. New Zealand Surveyor 294(June 2004), 3-9. Barry M 1995. Conceptual Design of a Communal Land Registration System for South Africa. South African Journal of Surveying and Mapping, December 1995, 23(3), No 139, 153 - 162. Barry M, Roux L, Barodien G and Bishop I 2002. Video-evidencing and Palmtop Computer Technology to support formalising Land Rights. Development Southern Africa 19(2), 261-272. Barry M and Fourie C 2002a. Wicked Problems, Soft Systems and Cadastral Systems in Periods of Uncertainty: South African Experience. Survey Review. 36(285), 483-496. Barry M and Fourie C 2002b. Analysing cadastral systems in uncertain situations: a conceptual framework based on soft systems theory. International Journal of Geographical Information Science, 16(1), 23–40. Barry M and Khan K 2005. Developing Talking Titler Methods in Creating Land Records. Research Report to Natural Resources Canada, Surveyor General, Western Region. Barry M 2006. Formalising Informal Land Rights: the case of Marconi Beam and Joe Slovo Park. Habitat International. 30(2006), 628 – 644. Barry M 2009a. Land Administration Strategy Formulation using GIS in Post Conflict Hargeisa, Somaliland. Surveys and Land Information Science. 69(1), March 2009, 39 – 52. Barry M 2009b. Standards for Oral Tradition Evidence: Guidelines from First Nations Land Claims in Canada. 7th FIG Regional Conference, Land Governance and the Environment, Hanoi, Vietnam, 19 -21 October 2009. Barry M 2009c. Innovative Response to Land Registration, Customary Title and Land Conflict: Applying Talking Titler Methodology: Report No 4 February 2009. British Council, Security Justice and Growth Programme, Nigeria. Barry M, Hunter A, Muhsen A 2009. Scalable Land Tenure Record Systems. Technika Chronika Tech. Chron. Sci. J. TCG, I, No 1-2. Barry M, Molero R and Muhsen A-R. 2013. Talking Titler: Evolutionary and Self-Adaptive Land Tenure Information System Development. South African Journal of Geomatics, Vol. 2, No. 1, January 2013. Beynon-Davies, P., D. Tudhope, and H. Mackay. 1999. Information systems prototyping in practice. Journal of Information Technology 14, (1): 107-20. Buckingham Shum S. 1997. Representing Hard-to-Formalise, Contextualised, Multidisciplinary, Organis¬ational Knowledge. AAAI Spring Symposium on Artificial Intelligence in Knowledge Management (Mar. 24-26, 1997), Stanford University, Palo Alto, CA, AAAI Press. Boehm, B. W. 1988. A spiral model of software development and enhancement. Computer 21, (5): 61-72. Buckley, J., Mens, T., Zenger, M., Rachid, A., and Kniesel, G., 2005. Towards a taxonomy of software change. Journal of Software Maintenance and Evolution: Research and Practice, 17(5), 309–332. Budgen, D. 2003. Software design. 2nd Edition ed. Harlow, England: Addison Wesley. Cheng, B., et al., 2009. Software engineering for self-adaptive systems: A research roadmap. Software Engineering for Self-Adaptive Systems, 1–26. Cousins, B, Cousins, T., Hornby, D., Kingwill, R., Royston, L., and Smit, W., 2005. Will formalising property rights reduce poverty in South Africa’s “Second Economy?” Questioning the mythologies of Hernando de Soto. Policy Brief. Debating land reform, natural resources and poverty. N° 18, (October 2005), 1-6, PLAAS, Programme for Land and Agrarian Studies. Danso E and Barry M 2012, Land Tenure Administration in Peri-Urban Accra: A Case Study of Bortianor. FIG Working Week, Rome, Italy, 6-10 May 2012, TS09A - Customary and Group Land Rights, 5739. Davis, A. 1992. Operational prototyping: A new development approach. Software, IEEE 9, (5): 70-8. De Soto, H., 2000. The mystery of capital: why capitalism triumphs in the west and fails everywhere else. New York: Basic Books. Deininger, K. 2003: Land Policies for Growth and Poverty Reduction, Washington DC, World Bank. Deininger K and Feder G 2009. Land Registration, Governance and Development. World Bank Research Observer, 24(2), 233 -266. Fortescue-Brickdale C 1913. Methods of Land Transfer. London, Stevens & Sons. Gilbert, A., 2002. On the Mystery of Capital and the Myths of Hernando de Soto: What Difference Does Legal Title Make? International Development Planning Review, 24 (1), 1-19. Harold, E.R., and Means, W.S., 2002. XML in a Nutshell, O'Reilly & Associates, Inc. Sebastopol, CA, USA. Hespanha J,van Oosterom P, Zevenbergen J, and Dias G 2006. A modular standard for the cadastral domain: Application to the Portuguese Cadastre. Computers, Environment and Urban Systems, 30 (2006) 562–584. Kimball, R., and J. Caserta. 2004. The data warehouse ETL toolkit: Practical techniques for extracting, cleaning, conforming, and delivering data. John Wiley & Sons, Inc.
Lemmen, C., and van Oosterom, P., 2006. Version 1.0 of the core cadastral domain model. Paper presented at XXIII FIG Congress – shaping the change, Munich, Germany. Lemmen, C., Augustinus, C., van Oosterom, P., and van der Molen, P., 2007. The Social Tenure Domain Model - Specifications of a First Draft Model. Paper presented at the Strategic Integration of Surveying Services, FIG Working Week, Hong Kong SAR, China. Lemmen C, Uitermark H, Van Oosterom P, Zevenbergen J, Greenway I 2011. The Road to a Standard Land Administration Domain Model, and Beyond. Proceedings FIG Working Week 2011. Marrakech, Morocco. Mason S, Barry M, Crone S, Geffen N, Camroodien L 1998. Information Management System for Affordable Housing Provision. South African Journal of Surveying and Mapping, 24(3), 129-138. Miller, J.M., 1985. Information Systems Planning - Principles and Practice, South African Journal of Library Information Science, 53(4) 183-190. Molero, R., Barry, M., and Hunter, A., 2010. Evolution of XML-based land records database for uncertain land administration situations. In: Proceedings of the Joint FIG Commission 3 and Commission 7 Workshop 2010, Sofia, Bulgaria, 15-17 November, 2010. Muhsen A-R and Barry M B 2008. Technical Challenges in Developing Flexible Land Records Software. Surveys and Land Information Science. 68(3), 171-181. Patel, N. 2009. Theory of Deferred Action: Informing the Design of Information Systems for Complexity, Ch X in Yogesh K D, Lai B, Williams M D, Schneberger S L and Wade M (Eds) Handbook of Research on Contemporary Theoretical Models in Information Systems. Information Science Reference, New York. Payne G 2002. Introduction in Geoffrey Payne (Ed.) (2002) Land, Rights and Innovation: Improving Tenure Security for the Urban Poor. London: ITDG Publishing. Payne G 2008. Owning up: what price home ownership? Housing Finance International, 23(2), 12-18. Platteau, J.P. 1996. The Evolutionary Theory of Land Rights as Applied To sub-Saharan Africa: A Critical Assessment, Development and Change, 27(1986), 29-86. Pullar N, Mcdowell A, Solovov A, Manoku E And Rizzo M P 2012. Solutions for Open Land Administration (Sola) Software - Customising Open Source Software to Support Land Administration Services and Responsible Land Governance, World Bank Conference on Land and Poverty, April 23 – 26 Washington DC. Rittel, H. J., and M. M. Webber (1984). Planning problems are wicked problems, In N. Cross (Ed. ), Developments in Design Methodology, Wiley, pp. 135-144. Rittel, H. W. J. & Webber, M. M. (1973). Dilemmas in a General Theory of Planning. Policy Sciences, 4, 155-169. Roddick, J.F., 1995. A survey of schema versioning issues for database systems. Information and Software Technology, 37(7), 383-393. Roux L and Barry M 2001. Using Video Imagery in Land Tenure Information Systems: A Study of a Communal Property Association in the village of Algeria, South Africa . Geomatica 55(1), 47-55. Roux L and Barry M 2011. Land Transactions in Social Housing in the Western Cape of South Africa: A Narrative of Kransdorp. Proceedings AfricaGeo, Cape Town 31 May – 2 June 2011. Salehie, M., and Tahvildari, L., 2009. Self-adaptive software: Landscape and research challenges. ACM Transactions on Autonomous and Adaptive Systems (TAAS), 4, 14:1–14:42. Shipton P 2009. Mortgaging the Ancestors. Ideologies of Attachment in Africa, Yale University Press, New Haven. Sjaastad, E & Cousins, B, 2008 Formalisation of land rights in the South: An overview. Land Use Policy, 26(1), 1-9. W3C, 2004, XML Schema Part 0: Primer (Second edition), Retrieved 2010, October 10, from http://www.w3.org/TR/xmlschema-0/. Ziff B 2006. Principles of Property Law, 4th Edition, Thomson - Carswell Toronto.